My oldest nephew is getting older and older. This past year he became very active in Karate and has been getting awards for his skills. I call him my Little Ninja so I made him his own stuffed ninja with a matching hat. 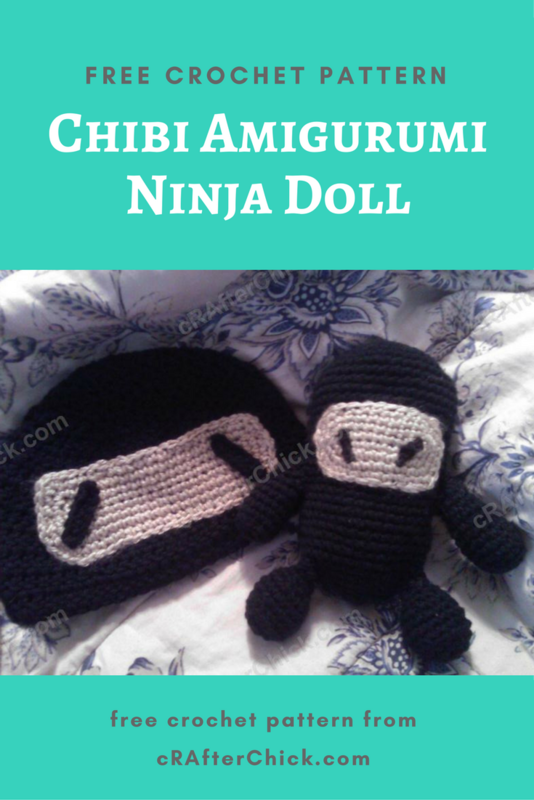 This crochet pattern is for the Chibi Amigurumi Ninja Doll seen in picture above. If you are looking for the Chibi Ninja Hat Crochet pattern, you can find it here… Chibi Ninja Hat Crochet pattern. Pull yarn through and leaving a long enough tail of yarn to secure the arms to the body of the ninja doll when attaching them. Pull yarn through and make sure to leave a long enough tail length to secure the legs to the body of the ninja doll. Round 1: Starting with a foundation chain of 9 ch, make 2 sc in 2nd ch from hook, 1 sc in each of the 6 st and 2 sc in last st of chain. (10 sc) Turning so you are working on back side of foundation chain to create more of a circle, work 2 sc in first ch, sc in each ch until last st, place 2 sc in last st. Sl st to top of first st. Round 2-4: Continue working around with 1 sc in each st but 2 sc in each of the four corners around your forming rectangle. Sl st into first st to complete each round. Continue until you are the final size you want. 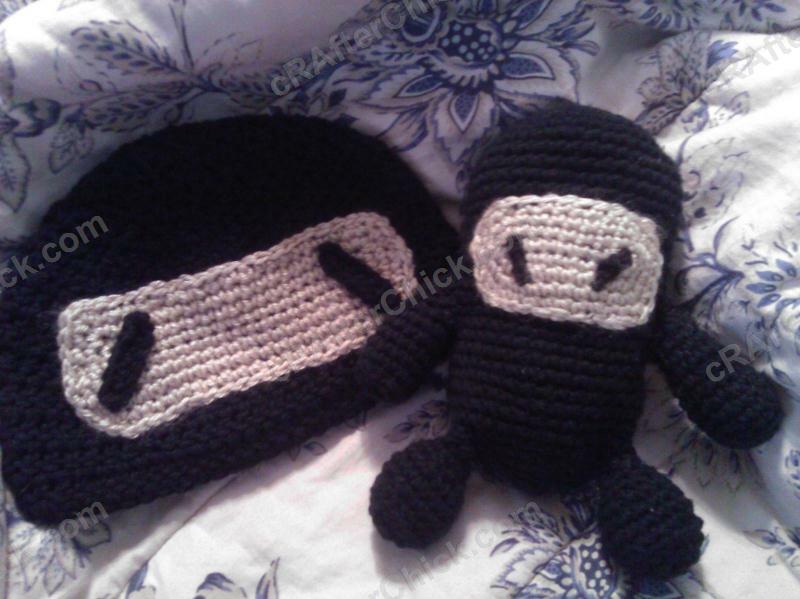 For my Chibi Ninja in picture for this crochet pattern I made 4 rounds total. Pull yarn through leaving enough tail to sew on face to secure to doll later when cutting. Put Ninja face area to side until needed. Using black yarn and leaving a bit of a tail for sewing eye in place when done, chain 4. Pull yarn through and cut yarn. Using large blunt eye needle, sew eye into position you want it to be in. I sometimes pin my in place to make sure I have them even or it drives me nuts. Finish off yarn from eyes behind face, and put face to side until needed for ninja doll. You can choose to put the eyes in all kinds of positions like: \ / or / \ or _ _ or even > < with small v’s instead of eye strip used above. Note:About half way through these rounds you will want to stop to attach the face to the front of the ninja doll and the two arms so you can hide seams inside of doll before starting to stuff as you progress. This is a good time to put the legs on before closing two rounds. By placing them facing forward and more to sides it allows the doll to sit up when not being cuddled. Make sure you fill up the Ninja Doll to the size, squeezability you desire with your fiberfill stuffing. I prefer mine not to hard stuffed but strong enough to hold shape and some weight to them.